The accounting system is the living embodiment of the Chart of Accounts. Each account holds the history and current balance of an asset, liability, equity, revenue, or expense item. After a reporting period, firms publish account balances and histories in financial reports such as the Income statement and Balance sheet. The account is the basic building block of the accounting system. In business, the term account has at least two different meanings. Firstly, an account is a fundamental building block of an accounting system. An individual account records the current balance and transaction history of a specific asset, liability, owner’s equity, revenue or expense item. A firm's accounting system may consist of scores, hundreds, or thousands of individual accounts. The complete list of active accounts resides in the firm's Chart of Accounts. Responsibility for updating and reporting account balances falls to the firm's accountants, who serve literally as "keepers of the accounts." Sections below further define account categories and illustrate typical transactions for each account type. Secondly, "account" refers to a formal business relationship between two parties, usually a seller and a customer. When one is an account of the other, each party has particular rights, privileges, and obligations. Firms that sell to other businesses designate their major repeat customers as accounts. In such cases, the seller may appoint one of its own sales staff as Account Manager, focusing primarily on that account. Account managers in this sense are responsible for sales performance with this customer. And, they are also responsible for building a continuing customer-seller relationship with the account. In some cases, the seller may carry customers as accounting systems accounts (as in the first definition above). Banks, for instance, refer to depositor customers as Liability accounts. And, banks carry loan customers as asset accounts. First, definition of account, and how accounts in the Chart of Accounts are the organizing basis of an accounting system. How different account categories use different rules for recording debit and credit transactions. How contra-accounts work against other accounts in their own categories. Another business use for the term "Account," by which business firms and their customers refer to each other. Five account categories: Revenue, Expense, Asset, Liability, Equity. Debits and Credits for account categories: Changing account balances. The Balance sheet always balances: Debits and Credits together maintain the balance. What are contra (valuation allowance) accounts? Contra accounts reverse the rules. Account, Second definition: Account as a seller-customer relationship. Accrual Accounting presents an introduction to the account role in an accrual system. See articles Journal and Ledger for more on account entry and account posting in the accounting system. The article Trial Balance explains how account balances transfer to financial statements at the end of an accounting period. Incoming revenues and outgoing expenses. These five kinds of items, in fact, represent the five account categories in an accrual accounting system. As a result, the accrual accounting system also provides the basis for the financial reports the firm must file periodically. An account category: Revenue, Expense, Asset, Liability, or Equity. All accounts must belong to one of these categories, although sub-categories also exist, as sections below explain, such as contra accounts or non-cash accounts. A unique account name and number. See Exhibit 5 Chart of Accounts below for examples. For Asset and Expense accounts, a positive balance is a debit balance. For Revenue, Liability, and Equity accounts, a "positive" balance is a credit balance. The term account gives its name to the profession, accounting or accountancy. A practitioner with appropriate training and certification is an accountant. The accountant's role is literally "keeper of the accounts." Each account serves to manage and track an item or item class. For accounting purposes, "items" appear in the above five above. And, for firms that use accrual accounting, these five are the only kinds of accounts possible in the accounting system. These represent items of value the firm owns or controls, and uses for earning revenues. Liabilities are debts the business owes to creditors. "Long-term liabilities" typically include obligations to lending firms and bondholders. Short-term liabilities, on the other hand, represent near-term debts incurred in operating the business. Equities are items the firm owns outright. As such, "equities" represent owners claims to business assets. In business, firms earn revenues from the sale of goods and services or investments. These accounts represent expenses incurred in the course of business. In reality, even a small business may identify a hundred or more such accounts for its accounting system, while a large firm may have many thousands. Nevertheless, for accounting purposes, all named accounts fall into one of the five categories above (see Chart of accounts, below). Every financial event for the company changes the balance of accounts. If the firm uses double-entry accounting (as nearly all companies do), every financial transaction causes two equal and offsetting changes to at least two different accounts. The impact in one is a "debit" (DR), and the change in another is a "credit" (CR). Those unfamiliar with double-entry accounting sometimes assume that a "Credit" adds to the balance and that a "Debit" lowers the balance. This rule is sometimes true but not always. Many people are familiar with the terms debit and credit from managing their bank statements, on which banks "credit" (add to) and "debit (subtract from) their checking accounts. In the double-entry system, however, whether a debit or a credit increases or decreases the account balance depends on the kind of account in view. The bank statement use is technically correct, but only because the checking account owner is—to the bank—a liability account. Liability category accounts increase with a credit and decrease with a debit. Exhibit 1, below summarizes Debit and Credit impacts in the five account categories. Exhibit 1. Debits and Credits have different impacts on different account types. Suppose, for example, that a firm acquires assets valued at $100,000. As a result, the firm increases (debits) an asset account for $100,000. This impact could occur in "Account 163, Factory manufacturing equipment" from the Chart of accounts below. Here, the increase is a debit because this is an asset account. A credit of $100,000 to another asset account reduces that account value by $100,000. If the firm purchased with its cash, it could credit asset account "101, Cash on hand" to restore the Balance sheet balance. If instead, the firm finances the purchase with a bank loan, the offsetting transaction could be a credit to a liability account. Increasing (crediting) "Account 171, Bank loans payable" by $100,000 would restore the Balance sheet balance. See the encyclopedia Double entry system for more on the accounting mathematics involved in double-entry accounting. What is a Contra (Valuation Allowance) Account? Not all accounts work additively with each other on the primary financial accounting reports. Sometimes one account works to offset the impact of another account of the same type. The so-called contra account work against other accounts in this way. And, in some situations, the contra accounts reverse the debit and credit rules from Exhibit 1 above. Contra asset and contra liability accounts are also called valuation allowance accounts. They have this name because they work to adjust the book value, or carrying book value for assets or liabilities, as the examples below show. The Balance sheet example running throughout the Business Encyclopedia has several contra account examples. Under Balance sheet assets, for instance, these accounts include "Allowance for doubtful accounts" and "Accumulated depreciation. Exhibit 2, below, shows how the contra accounts work against other asset accounts, "Accounts receivable" and "Factory manufacturing equipment." Exhibit 2. Contra asset accounts impact on Balance sheet asset accounts. You may notice from the Chart of accounts in Exhibit 5 below, that "Accounts receivable" (Account 110) and "Allowance for doubtful accounts" (Account 120) are both asset accounts. "Allowance for doubtful accounts," however, is a contra asset account that reduces the impact (carrying value) contribution by Accounts receivable. The Balance sheet result is a "Net accounts receivable," somewhat less than the" Accounts receivable "value. In the same way, Account 163, "Factory Manufacturing equipment" carries these asset values these assets at historical cost—the actual purchase price for these assets. This book value remains constant as long as the firm owns the assets. However, the asset's book value does reduce from year to year, as the Balance sheet shows. Contra Account 175, "Accumulated depreciation, factory manufacturing equipment," is subtracted from the Account 163 value, to produce the Balance sheet result "Net factory manufacturing equipment." Note, by the way, that depreciation expense works in this way to implement the accounting matching concept. This idea is the universal principle that firms report revenues when they earn them, matching them in the same period with the expenses that brought them. The complication results from the accounting definition of expense: An expense is a decrease in owner's equity caused by the using up of assets. The funds for asset purchase are not an expense—at least not at the time of asset purchase. Accountants assume that assets use up their value over time, thereby incurring "expenses" over time. As a result, owners use depreciation methods o turn asset purchase price into depreciation expense, over time. Two Journal Transactions for Writing Off Debt and Two for Charging Depreciation Expense. Exhibit 3. Journal entries for writing off bad debt and for entering charging a depreciation expense. All four transactions add to the value of the accounts listed. Debiting each of the two expense accounts adds to account value, as you would expect from the table in Exhibit 1 above. However notice here that crediting the two asset accounts adds to their value as well—just the opposite of what the same table prescribes for asset accounts. For contra accounts in this situation, the rules reverse, so that the basic equation, Debits = Credits, still holds for every pair of transactions. The examples also show why the balance in a contra asset account is a credit balance. The above examples show contra asset accounts, but there are also contra liability accounts that operate in the same way. For instance, under Balance sheet Liabilities, a long-term liability account "Bonds payable" may have with it a contra liability account such as "Discounts on bonds payable." The value in the contra account reduces the company's actual liability below the stated figure in the "Bonds payable" account. Contra liability accounts—like their contra asset account counterparts—also reverse the debit-credit "rules" from the Exhibit 1 table above. An addition to a liability account is usually a credit, but a similar addition to a contra liability account is a debit. For this reason, a contra liability accounts balance is a debit balance, even though ordinary liability carry a credit balance. Firms begin setting up a new accounting system by creating a Chart of accounts. This chart is merely a list—the complete list—of named accounts the company expects to use for recording and reporting financial transactions. The Chart of accounts thus defines the company's set of active accounts. The same list of accounts remains in view throughout the firm's entire accounting cycle. Business firms complete the full accounting cycle every reporting period. For public companies, this means ending a cycle every fiscal quarter as well fiscal year end. Exhibit 4 below, shows how account data move through the period. Exhibit 2. The accounting cycle. 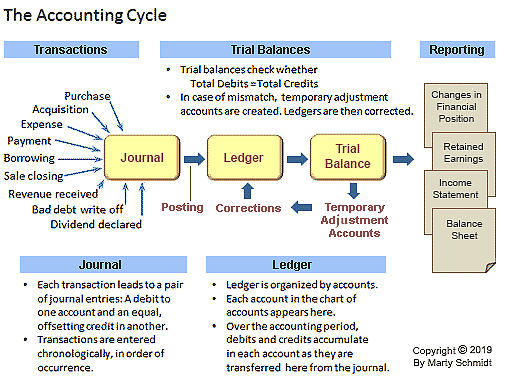 Transactions (Step 1) enter the journal when they occur, as the 2nd step in the accounting cycle. Accountants transfer (post) journal entries to a ledger as the 3rd step. As a 4th step, they check entries with a trial balance and correct them if necessary. The final stage occurs when the firm publishes financial statements. Note, however, however, that public companies must also complete the cycle by having 3rd-Party auditors review them and issue audit opinions, and then filing them with securities authorities. The first step in setting up an accounting system with a commercially-available accounting application, is creating the system's Chart of accounts. The application will at the outset suggest account names and reference numbers for the Chart of accounts. It will base suggestions on the size and complexity of the company and the nature of its business. Some small firms will merely use the program's default suggestions, but most will further tailor the list to fit their situations. The chart must represent all five basic account categories (assets, liabilities, equities, revenues, and expenses). The firm has a complex organizational structure. The firm has a complex cost structure. It produces and sells many different products or services. The firm has many customers, most of whom need their own "accounts." On the other hand, the accounting materiality concept suggests that firms can disregard small, trivial, or items the firm rarely uses. When these transactions do occur, the accountant can enter them under the headings of a few more general and inclusive accounts—such as "Miscellaneous expense." Reference Numbers Organize the Chart of Accounts. The rank order of the account within its category. The example Chart of Accounts in Exhibit 5, below, uses this 3-digit scheme. This approach allows for at most 100 individual accounts in each tier (e.g., Asset accounts). A 4-digit plan would, of course, designate asset accounts with the range 1000 - 1999, allowing for a possible 1,000 different accounts in that tier. The first digit signals immediately the account category. Therefore, an account number beginning with 1, for instance, must be an asset account. The initial account number set should allow for later expansion. E.g., the chart might initially list Account 140, Prepaid Expenses, followed by Account 150, Employee Advances. If then, the firm needs to add accounts between these two, there are nine new account numbers available. Numbers after the first digit organize accounts roughly in order of currency. "Current asset" accounts have lower numbers than "Long-term asset" accounts for that reason. Current liabilities accounts have lower numbers than long-term liabilities accounts. Revenue and expense accounts carry numbers roughly in the order they appear on the Income statement. The Exhibit 5 Chart of accounts, below, is just an extract from real a chart of accounts. The purpose of this version is to show the general approach to account numbering and naming. A complete example—even for a small company—would no doubt list many more accounts. Exhibit 5. Example Chart of accounts for a small firm. The chart is a list of account names and reference number. Note especially that for a large and complex business, the list may include hundreds or thousands of items. In many kinds of situations, customers enter a relationship with sellers by creating accounts with them. The relationship between seller and customer then differs from the customer-seller relationship involved in a one-time purchase transaction. The account implies the relationship will continue for a timespan, during which seller and customer have rights, privileges, and obligations towards each other. These are not available to those without the account relationship. Firms that sell to other businesses recognize repeat customers as accounts. The seller may designate one of its own sales staff as dedicated Account Manager for that customer. Account managers of this kind are responsible for account planning and building a continuing relationship with the customer. They are also responsible for sales performance with this customer. A bank customer with a bank account, for instance, has a right to deposit and withdraw funds, write checks against that account, and receive interest payments for funds on deposit. The bank (the seller) on the other hand, may use the depositor's funds for its investments and charge the account holder maintenance fees. Retail merchants sometimes recognize specific customers as accounts. Account holders may have the right to charge purchases with merchant-issued credit and make monthly payments on their account balance. Sellers and service providers sometimes actually create for each customer an accounting system account. Banks, for instance, carry depositor customers as Liability accounts. And, the same banks recognize loan customers as Asset accounts.